One of our most popular area attractions is Sunspot, New Mexico. 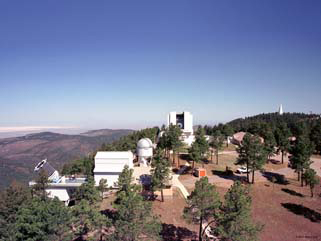 Our National Solar Observatory consists of two different facilities; the Kitt Peak Observatory in Arizona, and the Sacramento Peak National Solar Observatory at Sunspot. Sunspot is actually the name of the small community where the observatory is located. Even for the non-scientist, a visit to Sunspot can be rewarding and educational. The solar observatory was originally built in the Sacramento Mountains to take advantage of the high, clear air and deep blue skies. But why study the sun in the first place? We frequently take it for granted, but the sun is what generates our weather systems, and affects world-wide communications, and is, in fact, what makes life on Earth possible. Two recent solar events focused attention on the sun. The first was an annular solar eclipse which took place on May 20th. A solar eclipse occurs when the Moon comes between the Earth and the Sun. A “total eclipse” happens when the disc of the Moon completely blocks out the disc of the Sun so that only the corona, or the Sun’s atmosphere, is visible. What made the May eclipse even more spectacular was the fact that it occured when the Sun was closer to Earth than usual and the Moon was farther away than usual. 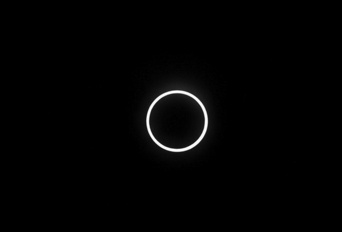 This created an annular, or “ring” effect where the Moon’s outline fit slightly inside that of the Sun so you saw a ring of sunlight. This happens occasionally because both the Earth and the Moon travel in eliptical, rather than circular orbits. You had to be in just the right path of the Moon’s shadow to get the full effect, but it was well worth seeing and New Mexico was a perfect place to view it. The next solar event that took place on June 5th was even more unusual. 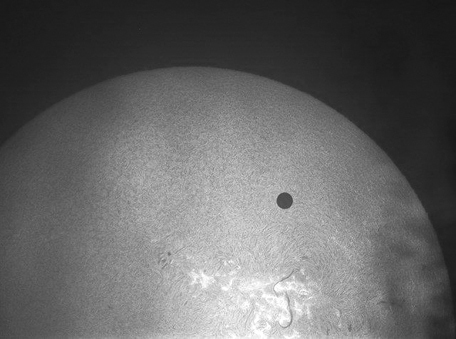 It was the transit of the planet Venus where Venus passed between the Earth and the Sun. You could only see this one through a telescope because Venus is so small compared to the size of the Sun. It took several hours for the disc of Venus to travel across the face of the Sun. What makes thisˇ event so unique is the fact that, because planets travel in eliptical orbits, and do not all orbit in the same plane, Venus will transit the Sun twice in eight years, it also happened in 2004, and then will not do it again for 105 years! The next transit will occur in December of 2117. Don’t wait up. While doing some background on this article, I also found a way cool phenomenon that was first observed at Sunspot several years ago. It is called a Moreton Wave named after the scientist first saw it. When a particularly violent eruption occurs on the surface of the Sun, called a solar flare, it will sometimes generate a compression wave which expands outward across the surface of the Sun much like a ripple spreading out across a pond when a pebble is thrown in. The Moreton Wave, however, is much more massive and can travel at speeds up to several thousand kilometers per minute. The wave has been observed traveling completly around the Sun. Although the dynamics are totally different, the Moreton Wave has al’so been described as a “solar tsunami.” You can go on You-Tube and type in “solar tsunami” to see an awesome video of the event. It looks like a movie special effect. As you drive down to Sunspot on Highway 6563 (the wavelength of hydrogen) you will see some new signs along the road with the names of the planets. These signs and some displays at the Visitor Center make up the largest solar system model west of the Mississippi. Starting at Sunspot, there is an 18 foot geodesic dome which represents the Sun. Inside the visitor center are models ¡of all of the planets to the same scale, with the Earth about 2 inches in diameter. The model stretches all the way to Cloudcroft where the orbits of Neptune and Pluto cross. Pluto was downgraded to a planetoid, but many people still refer to it as the ninth planet. The Sunspot Visitor Center has many fun and interactive displays as well as nice little gift shop. Starting at the Visitor Center, you can get a brochure for a self-guided walking tour to the various telescopes on the grounds. Sunspot is open every day this summer from 9 am until 5 pm and it is free. The Sunspot Highway is also a National Scenic Byway, so the drive itself is beautiful. Take the whole family and bring a picnic. Enjoy! This article originally appeared in the July 2012 print edition of the Mountain Monthly.